Nipper readers and their observations needed full consideration. During one winter a mother wrote to suggest the Nipper should be more warmly clad. Shortly afterwards, when I depicted the Nipper being examined by a Doctor, another tender-hearted reader wrote ‘If you please do not make that dear little boy ill. You will break the heart of every woman in England if you do’. Admirers advanced ideas for new pranks and one child of eight suggested emptying ink on daddy’s head; putting soap flakes in the pudding and shutting the cat in the coal box. To please this young lad I adopted the last of these suggestions. The day following the appearance of this strip, I was bombarded with letters from dear old ladies charging me with cruelty to animals. This shows how the younger generation can lead its elders astray! Since then I have tried hard to keep the Nipper a little more under control. Occasionally the Editor would return one ‘ . . . as the subject might upset sensitive readers of the Daily Mail. Perhaps you might keep this in mind for any future drawings and at the same time let us have a duplicate to replace the enclosed’. Not even the eagle-eye of the Editor is infallible, to errors of my creation. One cartoon depicted the Nipper unravelling his nurse’s knitting. To my surprise I received an avalanche of letters pointing out that he was pulling out stitches from the wrong end. One reader went so far as to enclose a piece of knitting and a letter challenging me to unravel it in the manner depicted. The fact that hundreds of women took the trouble to write about such a trifling matter shows how closely the exploits of the Nipper were studied and how accurate I must be. Very occasionally a Nipper feat was embarrassingly true to life as this cutting from the Daily Mail of 27th July 1954 shows (right). Fortunately it was not my cartoon that prompted the incident. Besides appearing on a daily basis in the Mail, the Nipper was also featured in a series of twelve postcards produced by Valentine & Sons which were released on 12 May 1935. This was followed by a doll made by Messrs. Merrythought Ltd., of London, which came onto the market from July. In time for the Christmas shopper was the marketing in November of Nipper cartoons in colour on china and earthenware 3 goods by EC. Hales of London. This was followed by the 1936 edition of the Nipper Annual which came out on 28 November. The first edition was sold out by 6 December necessitating a reprinting. Messrs Beales, T. Powner and Plowright Ltd., of Manchester put forward a proposal to use the cartoons on cheap material to be made into childrens frocks, The Mail did not favour the idea and in consequence it was turned down. That year I was also honoured to be included among a number of well known artists such as H. Bateman, Pop, Bruce Bairnsfather, W. Heath Robinson and others to show drawings depicting Modern Humour at an exhibition organised by Henry Graves and Co. Ltd., during May and June. The Nipper also appeared abroad, albeit briefly. A strip which appeared in the Mail on 12th March 1955 was pirated and appeared in a newspaper, in Turkey of all places. Probably the most significant development of the year followed a letter from the Editor in June: ‘Do you think that the time arrived to introduce another character into the Nipper strip? Personally I think the strip is retaining its appeal, but I gather the impression that you are approaching a point where it will be necessary to introduce a little brother or sister as a permanent companion to Nipper. . ‘ I had been giving some thought to this problem for some time and in reply I proposed a rather attractive secondary character – a baby, younger than Nipper. The outcome was the introduction of this character under the heading Nipper finds a playmate who first stepped into the strip on 11 July 1955. Nobby as he ultimately came to be known years later, had arrived. In the meantime there was periodic conjecture as to whether he was the Nipper’s baby brother, cousin or neighbour. He was also, more often than not referred to as Baby, Pal and a tongue-twisting Nipperlet – the confederate in Nippers naughtiness. I have no recollection of naming him specifically until after the war. In February 1936 the Editor decided to introduce a new series of articles in which readers were to participate. The project sought parents to submit stories of their child’s “amusing acts of mischievousness; feats of unconscious audacity; surprising deeds of uncalculated and forgivable naughtiness”. The best submissions were to be rewarded and published under the heading of ‘Nipperisms’ and were illustrated by myself with the Nipper as the character involved. The idea was later extended to include sayings as well as deeds. The Nipper was kept in the public eye when in March a special attraction for juvenile visitors to the private zoo park of G. Tyrwhitt-Drakes at Cobtree Manor near Maidstone, Kent, was opened. The enclosure called Nipper’s Zoo contained various kinds of baby animals including a Shetland pony, two kids, baby rabbits and piglets. A new series of Nipper postcards was introduced by Valentine & Sons and a series of Nipper childrens age birthday cards by W. McKenzie & Co, Ltd. In time for Christmas were Nipper Walking Toys some of which were purchased by members of the Civil Service for distribution to hospitals and other charities. For the discerning shopper there was a Nipper bottle containing Potter & Moore’s Garland perfume, marketed by Selfridges. Less exciting, for office use were Nipper files in five different sizes in seven distinct colours. One of the highlights of the year was the publication of the 1000th appearance of the Nipper in the Mail on 28 November 1936 which was quite a milestone. Nipper also went abroad once more, this time legitimately and featured in a Dutch magazine for railway enthusiasts, To round off the year, the 1937 edition of the Annual appeared ‘to gladden the hearts of readers with the laughable escapades of that most mischievous infant terrible’ reviewers were pleased to note. As I was now in a financial position to move to the sea, we settled into a Tudor style house ‘Croft Corner’ about half a mile from the beach, Angmering on-Sea, West Sussex. It was a popular area for those in the theatre world, The Crazy Gang – Nervo and Knox, Flanagan and Allan, amongst others. From time to time I used to see Jack Hylton and Tom Webster the artist, at Ham Manor Golf Club where I was a member. To add more interest to the strip I introduced a further character, a Scotty dog (referred to as Mac though known to the family as Sandy) to add to the mayhem caused by Nipper and Nobby. This was from 21st January 1937 and was featured intermittently until the war brought the series to a premature close on 21st June 1941. Then there were a couple of strips where the roles were reversed – Dad by the Nipper. It was always a case of creating a new humorous situation which was not always easy. The continued popularity of the cartoon was duly rewarded by the Daily Mail renewing my contract from 5th June 1937 for a further period of two years with an increase in salary from £2000 to £2500, per year. As a result I was able to consider moving to a larger house not so far away. Eventually we chose a house; Knowle, Hurst Road, East Preston, near Littlehampton. It was just across the road from the church and outside the exclusive Willowhayne Estate. It was not merely a case of producing a cartoon strip for publication in the Mail on a daily basis. The paper required at least a months supply of strips to hand. If I wanted to get away for a few days holiday my output had to be stepped up to cover this period. Fortunately I was able to work from home and had done so for some time, so I did not have to contend with a daily train trip to the city. For a while I did have a studio in Littlehampton but this was not a satisfactory arrangement. For the now yearly Annual, the cartoons had to be chosen from among those already published and new ones drawn as well as designing a suitable cover. 1937 was no exception and the 1938 edition appeared on 25 November. The following year saw the Nipper endorsing Alpha socks for children. The firm’s logo for this product also featured as a machine stamp cancellation for postage stamps. A further series of six postcards of the Nipper were marketed by Valentine’s. 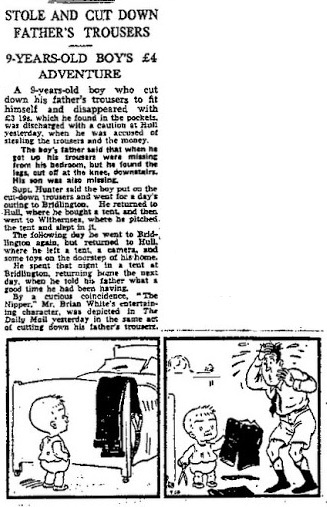 Between 1937 and 1939 the Nipper with other well known cartoon characters were featured in a series of comics. These were called Merry Miniatures and – were and still are the smallest comic measuring 1.5 by 3.75 inches. Once again at the end of the year the Annual made its welcome appearance with the 1939 edition. A most unusual character was now introduced into the strip to support the Nipper with his mischievous episodes, namely a penguin who first waddled into the strip on 25 April 1959 and who featured until 12 August 1940.